You're not the first parent to find a few pills in your child's pocket while washing his clothes. Considering the epidemic of prescription drug addiction and an uptick in overdoses around the United States, it's not a surprise. Addiction is an inclusive disease that does not discriminate by social or economic status. Unfortunately, some kids use, abuse, and sometimes become addicted to drugs. These days, this behavior goes far beyond "traditional" substances, such as alcohol, cocaine, and heroin. Today, kids also abuse cough medicines, glue, and many prescription medications. One of your first steps you may want to take when you find an unknown pill is to identify which drug it is. Knowing the medications that are abused most often and how to search for pills will help you figure that out. Opioids: Prescribed to treat pain. Central Nervous System Depressants: Prescribed to treat anxiety and sleep disorders. Stimulants: Prescribed to treat narcolepsy, ADHD, and obesity. 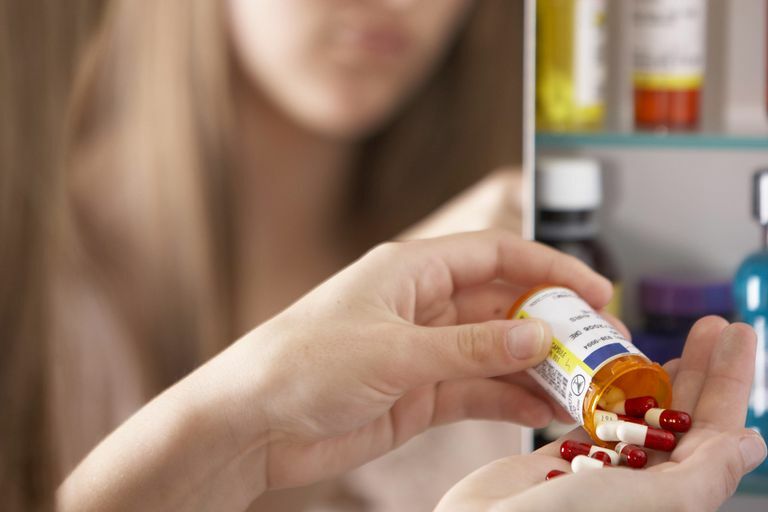 The U.S. Drug Enforcement Administration (DEA) offers a helpful booklet for parents that can tell you more about these drugs: Prescription for Disaster: How Teens Abuse Medicine. It includes photos and many of the common street names as well. Familiarizing yourself with this slang can help you decode your teen's conversations if needed. One small, round, blue pill you're more likely to find is Adderall. It has the marking "AD" on one side and the number "10" on the other. If you use the pill identification wizard on Drugs.com and search by "Shape/Color" using the terms "round" and "blue," the resulting long list of pills includes only one with those markings: Adderall 10mg tablets. Some teenagers take Adderall without a prescription simply to help them concentrate and to do better at school. Most others take it to get high, either getting it from a friend or buying it at school. The youths either swallow them or grind them up and snort them for a quicker effect. A round, red pill with the markings "C C + C" might also be among the cache of meds you just found in your kid's pocket. Restarting the pill identification wizard, and again searching by shape and color—this time for a "round" and "red" pill—will give you a number of options. Although there are many similar pills, only one has those markings: Coricidin HBP Cough & Cold Tablets. Although it is just a cold and cough medication, many teens actually abuse the dextromethorphan (also called DXM) contained in these little red pills. Coricidin HBP Cough and Cold is also known as "triple C" in the illicit drug market. In addition to dextromethorphan, it contains an antihistamine. Teens take it in large doses because it produces hallucinations and other side effects. Deaths from kids abusing DXM and Coricidin have been reported. Using the same database, or the one at Pillbox, you can run a search for any mysterious pills you find. Once you identify them, it's time to decide what to do about it. If you don't think that a meeting with your child will go well or you don't feel comfortable talking to him about this, you might talk to a relative or adult your child respects. They may be willing to sit down and have a conversation with your teen on your behalf. This may help him open up about what's going on and give you some insight for the next steps to take. You can also go the professional route and schedule a visit with your pediatrician or a child psychologist. If you raise your concerns about your suspicions that your child is abusing drugs, they can bring up the subject during the appointment. While it can be shocking to find unknown pills in your teen's possession, do your best to stay calm and approach the situation with a clear head. There are a number of steps you can take that can get them the help they need, though an argument is often not one of the best ways to begin the conversation. National Institute on Drug Abuse. Misuse of Prescription Drugs. DrugAbuse.gov. 2018.